Beginning in the second half of the nineteenth century, Native children were – almost always forcibly – taken to boarding schools, some close by, some far away. In these schools that were often run like military academies (replete with corporeal punishment), the children were neither allowed to speak their Native languages nor wear traditional clothing or practice their tribal customs. Instead, they had to learn to live by the bell, march to the whistle, and get used to names, such as Tom, George, and Sally. Pursuing an “English only” policy that was to “kill the Indian and save the man,” these schools were instrumental in eradicating Native culture. The autobiographical texts Krupat discusses in great detail give us the real story written by the students themselves, their feelings, their fears and hopes. For some students, writing about their experiences meant coming to terms with a difficult period of their lives; for some, it meant remembering certain aspects with fondness, such as meeting children from different cultural backgrounds and learning a new language. For every one of these Hopi, Apache, and Navajo children, however, it meant leaving the life they had previously known. 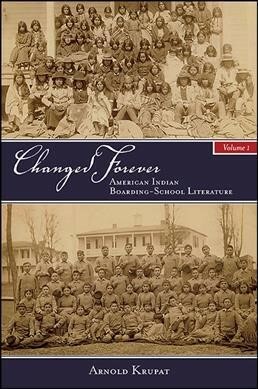 As such, Changed Forever is a must-read for everyone interested in the real story behind the boarding school system. Arnold Krupat, Professor Emeritus at Sarah Lawrence College, is one of the most influential and original scholars working in Native American Studies today. He is the author of many books, including For Those Who Come After (1989), The Voice in the Margin: Native American Literature and the Canon (1989), The Turn to the Native (1998), Red Matters (2002), and “That the People Might Live”: Loss and Renewal in Native American Elegy (2012). Krupat is a recipient of six fellowships from the National Endowment for the Humanities and has also held a Fulbright Fellowship as well as a Woodrow Wilson Fellowship and a Guggenheim Fellowship.